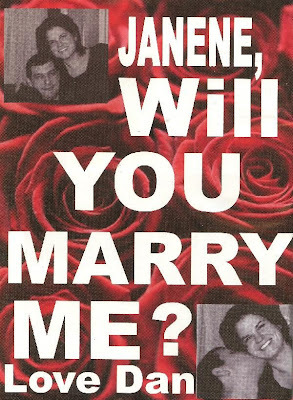 Congrats to Janene and Dan on their engagement. Big Hudge Brownie points go out to Dan and his Amazing show of LOVE to Janene and UNDERSTANDING of her true passion for scrapbooking. Dan you single handedly made millions of woman jealous. All the best to both of you. If you didn't know Dan placed this add in Creating Keepsake Magazine for all the world to see. Janene is one of our awesome teachers and she will be teaching her STAR BOOK class on Sunday May 18th at 11:30, the cost is $30. A week has gone by and we have unpacked our boxes and Lisa has traveled safely back to Texas. Now we are gearing up for the next project. It has been 2 weeks since my last post and so much has gone on as you can see. The next couple of weeks will be busy too. We have Memory Expo and National Scrapbooking weekend coming up. And next week we have kids camp Tues - Friday. I also wanted to send out a big Thank You to our newest customers that came all the way from England to shop at our store. I had a wonderful time with them and I hope they come back and visit us soon. I know when they get home they will be the envy of all their scrapbooking friends. Maybe they will cross the ocean for one of our crops, and bring their friends, wouldn't that be fun. I love the way all these new products look. Don't you? Have agreat weekend and we will see you at the store real soon!!!! The boxes keep arriving and we started packing. The countdown has begun. Less than 24 hours I will be loading my truck and heading up to Danbury to our weekend retreat. I cannot express enough that our store will be closed and we will be operating out of our Mini Store at the Sheraton. Lisa arrives tomorrow night, I can't wait to meet her in person. We still have room in some of her classes if anyone wants to attend you can look at our website to see the times or if you want to buy a kit after the class you can. Well, we have a lot to get done, so I will leave you until Tuesday. That is when the store will reopen. If you miss us or if you NEED to get some much needed supplies or inspiration stop by. New Stuff is coming in everyday from CHA so if you can't wait, join us in Danbury.